Warning, rant forthcoming. 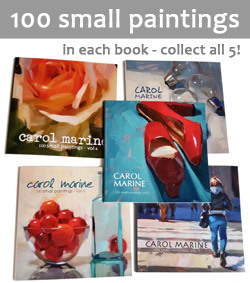 So, for the past 3 years I've been using Blurb to create one book a year, each featuring 100 paintings from that year. I was becoming moderately unhappy with Blurb since they had raised their prices so much, but was willing to continue as the competition was sparse. I recently put together my fourth book and ordered a test copy. I was appalled at the quality! I wrote to them to see if maybe this was an accident. It's been 4 days and I still haven't heard back. My lovely stepdaughter, Maddie, did some research and found a new publisher -- Magcloud. It is owned by HP and I am giving it a try. So, my book will be later than usual this year, but if all goes well I will have it out before Christmas, it will be bigger, and a lower price! 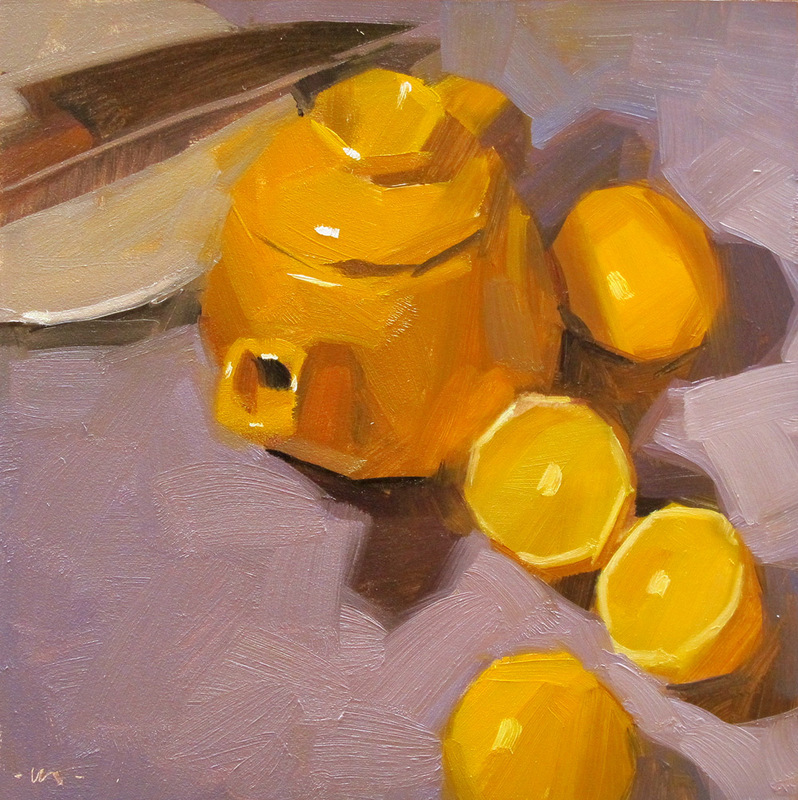 Beautiful lemons and teapot! I look forward to hearing how the new publisher works out. Hi Carol, the knife works really well with your rant;)))) Looking forward to you new book. This is wonderful, love the yellow. I love your composition and that trail of lemons that lead you to the teapot. This makes me like YELLOW!!! wow, Carol - thanks for the scoop on Blurb. I've been wanting to do a book of garden paintings...and have dragged my feet on it for so long. Sad to hear their quality has gone so far down-hill. But I just clicked over to the Magcloud site- looks interesting! Thanks for sharing the info!! LOVE these cheery yellows btw! Happy Thanksgiving to you & your family! Carol, love this wonderful yellow painting; so bright and cheery. The pink background sets it off so well, yet somehow brings the brightness of the yellow into almost softness. lovely lemons! I hope your book was an accidental lemon, too. I have started making a book in blurb on your (and others) recommendation... but maybe I am too late!!! Me encanta! Las pinceladas son geniales. Hi Carol, been a while since we talked (former UT studio art major, originally from Austin). I design for a living and my take on this is you get what you pay for, one has to figure out what your time is worth fiddling with this. I recommend learning the basics of a page layout program and partnering with an online printer. Although Quark or InDesign are what we use in the industry as professional tools, they may be a bit much for your needs and they are not cheap. I heard PagePlus by Serif is easy is rated high from online reviewers like CNET. I would find an online printer or even one locally to help you from there. Your book layouts are so simple perhaps you could find a student from a local art institute to do this for you. Caution, never use Word, it was never intended for layout, it is essentially a word processor and printers loathe getting these files. One thing to keep in mind is that your layout can be exported as a PDF with settings. Printers can tell you what those settings need to be. Best of luck, shoot me an email anytime if you need advice in graphic design/layout. Love your painting... as per usual. Really want to comment on the your Blurb blurb. Absolutely classic... as I published and ordered my Blurb book on this very day and THEN looked at your blog only to see this thumbs down rant. I am, however, trusting The Process and remain hopeful that I will love it when it comes in the mail. Thanks for all your inspiration and guidance. I am so-o-o sad to read of your latest experience with our treasured publisher Blurb. They have done four books of my paintings and I had considered them makers of magic. What's happened? Thanks everybody! I too am incredibly disappointed with Blurb, especially since I had such good luck with them for 3 years! I will post a picture soon of how the quality has gone down so you can see what I'm talking about.